Did You See the Flag? I stared deep into the water, as the waves crashed upon themselves, forcing me into the deepest, most peaceful state and I inhaled. The last blissful day of summer had come and no matter what I did, was going fast. I tried to memorize the feeling of the sea air, and the way my heart barely needed to pound, praying that if I could hold onto it tightly, I could recapture it at any time. Times when I might need it the most…like when I worried, about my boys being safe, or my parents being healthy, or when the twisting of the daily grind pulled me into a frenzy, making me forget all about how grateful I was to have such an amazing life. For the times when others’ drama seemed almost like my own and for those days, when I just wasn’t sure if I could make it. I inhaled again, thinking perhaps a little prayer might do or a plea to the universe for an easy year. But even that seemed like too large of a request. I mean, surely I was aware that to wish for an easy year was in fact missing the point of life to begin with. I glanced at my watch to notice that we were down to our last 10 minutes of summer and inhaled one last time, hoping for some sort of sign. As I looked up again, the flag caught my eye. 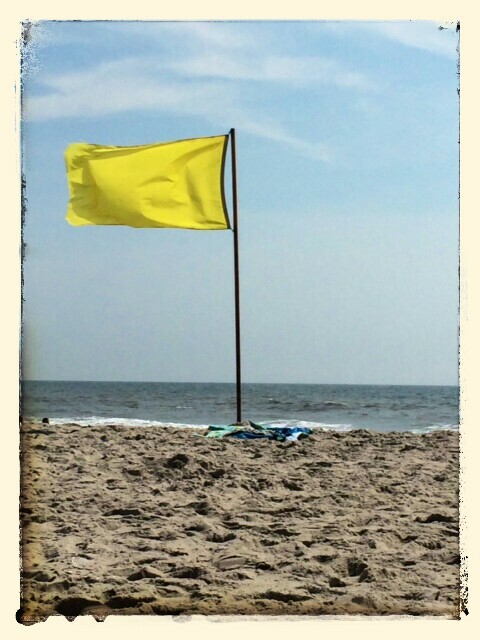 The giant yellow, flowing in the wind flag that had been in front of my face for an hour, was now blowing as if the only thing alive on the beach. As the ocean seemed to grow still, the sound of the flag rippled loudly in time with the breeze. Why? Why now was that all I could see and hear? Where was it before? And why was it yellow? I looked again out to the ocean and noticed the waves were rough and only a few swimmers remained. And then it ocurred to me: The yellow flag. The one that tells us to proceed with caution. The one that says, you can go, just watch your step. Proceed with care. The one that says, slow down, pause, take a breathe, be mindful of what is around you. The one that says, you have arrived, again, now make sure you don’t miss it while you are here. On My Way to Oz…countdown. Great essay…esp. re your mind set: “worried about…”when you & I in rel with our peeps, we want every thing to work out & it is not because we think they are incompetent, but because we love them & want their live to work with min. upset. Love you girl. You are the best! P.
It was a great, thought provoking reflection. When you left the beach, I forgot to be mindful of the on-going peace of the day and got caught up in the going part. Today we went to the beach…. the empty beach…. and I reflected on how frightened I’ve been all summer to go, thinking as I went how precious these days are and how quickly they fly away.